Cindy Rinfret's room at the Kips Bay Decorators Show House Palm Beach. Ticket sales raise critical programming funds for both Kips Bay Boys & Girls Club of Palm Beach and New York, whose graduates—including Jennifer Lopez, J. D. Martinez, and Kerry Washington—credit their success in life to the foundation, skills, care, and friendship they experienced at Kips Bay. 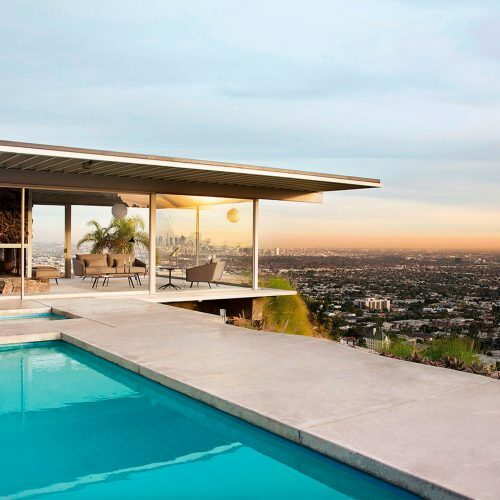 Below, Galerie provides a look at what not to miss at this year’s showhouse. 1. New York–based David Scott conceived an elegant and upbeat dining room that mixes antiques and modern pieces, making it the perfect spot for a multigenerational family dinner. 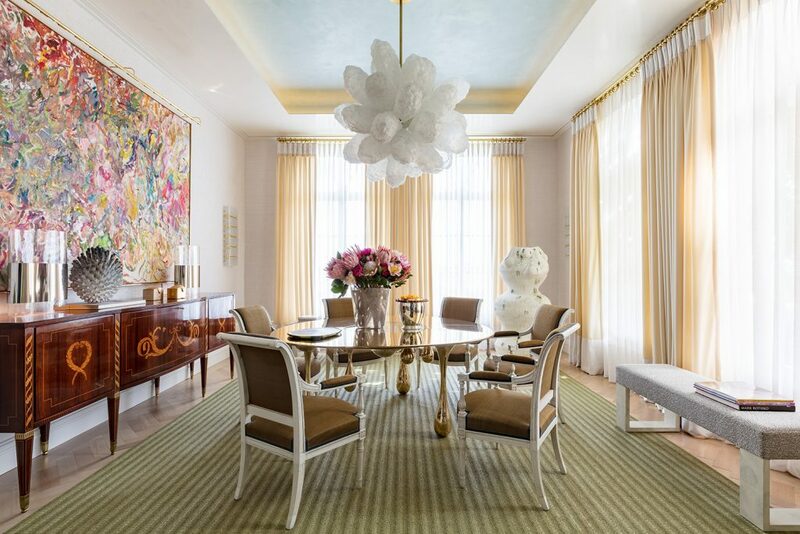 1790 Directoire chairs surround a modern, dripping bronze table by Chinese artist Zhipeng Tan, over which hangs an airy Jeff Zimmerman blown glass chandelier. A Larry Poons abstract provides color and movement. Floor-to-ceiling window treatments are by The Shade Store. 2. 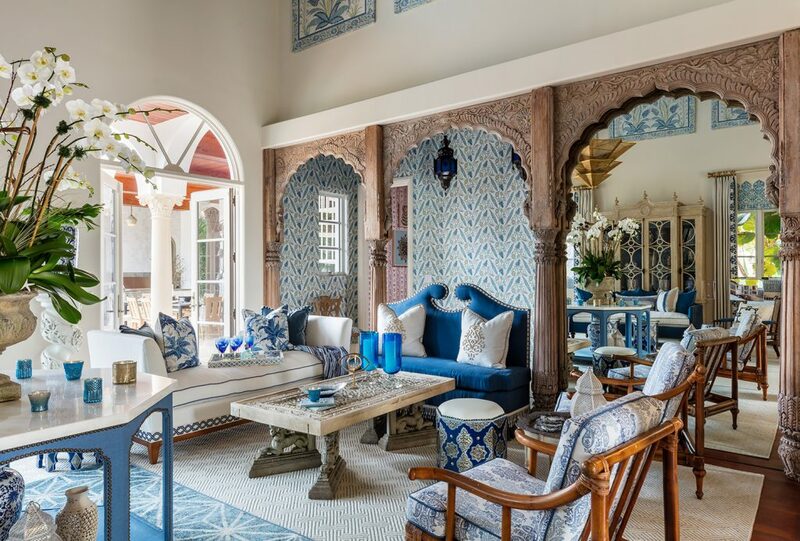 Palm Beach design hero Jennifer Garrigues was at the forefront of creating exotic, worldly interiors, which she also exhibits at her namesake island shop, a favorite of local sophisticates. 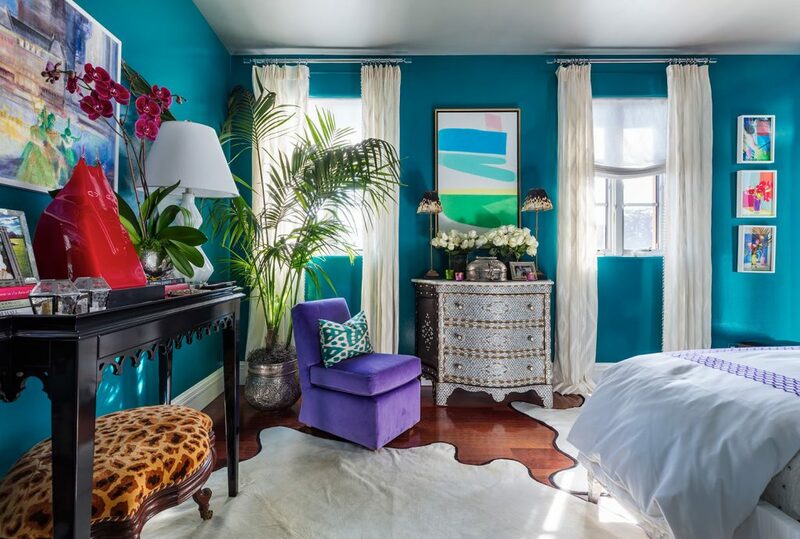 Here, she takes bold colors and Moroccan influences to a striking new level. High-gloss turquoise walls by Benjamin Moore mix with saturated citrus greens and purples, while trinkets from around the world hint at a well-traveled inhabitant. 3. 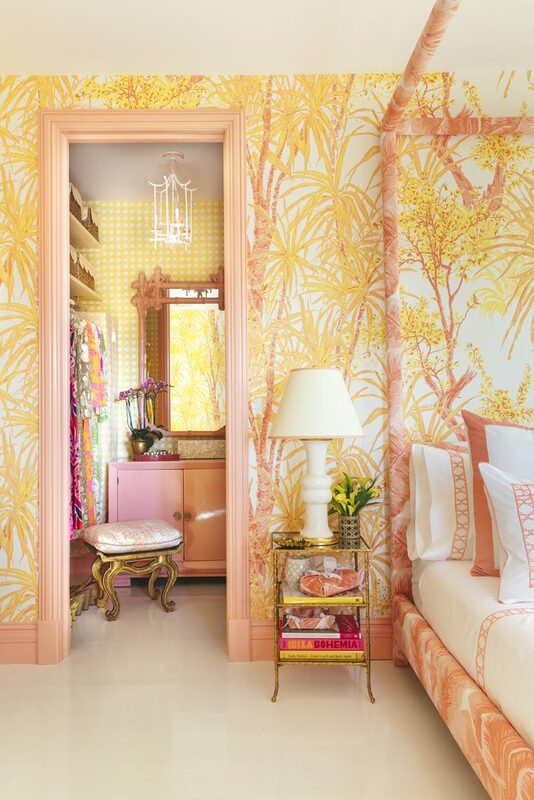 As this jungle-themed bedroom makes clear, Meg Braff, who is based in Locust Valley and has a Palm Beach residence, knows a thing or two about tropical design and glamour. Braff’s own Rainforest wallpaper covers the walls with whimsy, while a custom-built, low-lying parsons bed makes ceilings appear higher. Cambria surfacing, a statuesque lavatory sink with brass legs and Purist faucet, both from Kohler, take center stage in the bathroom. 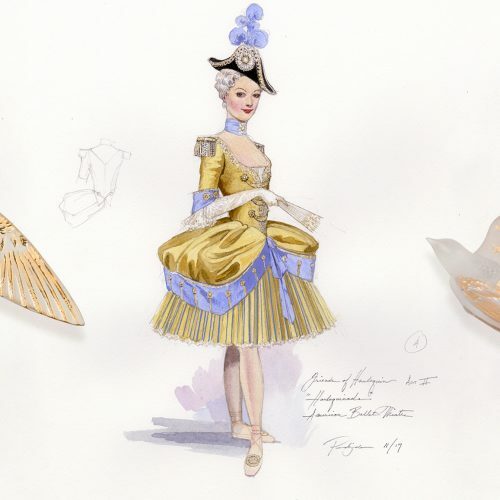 The closet was curated with dresses from Cabana Vintage, by Alixe Laughlin, who scours resort towns to find vintage pieces, which she restores with inspired aptitude. 4. Los Angeles–based designer David Phoenix had a soothing retreat in mind when he designed a relaxed but elegant family room. Built on a neutral color palette with subtle pops of blue and green, the room boasts stunning views of the Intracoastal, outdoor loggia, and pool deck. Portuguese limestone floors and white walls modernize the space and grant a Chesneys Fireside mantel center stage. 5. 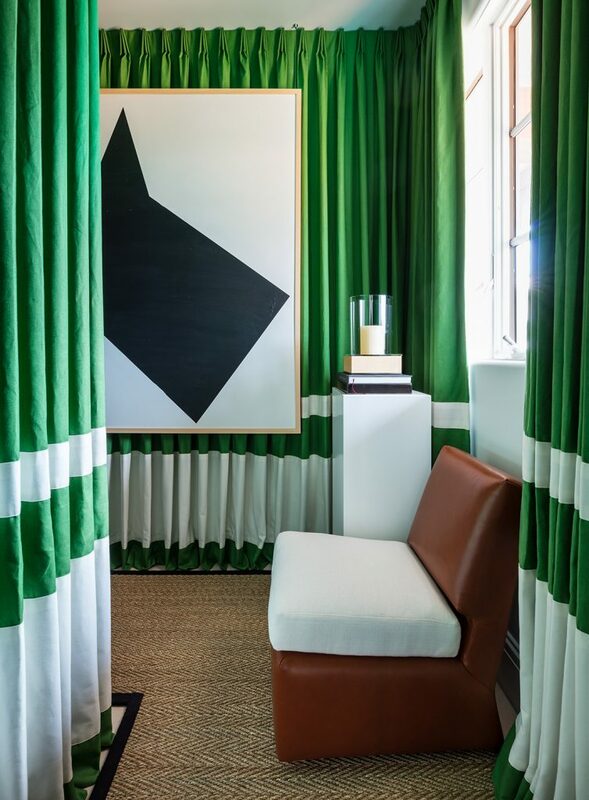 Transitioning from room to room is an event unto itself, thanks to Connecticut-based Billy Ceglia, who designed the halls leading from the kitchen, back staircase, and mud hall with a jazzy green lacquered Madagascar Cloth and incorporated an honor bar, a cozy nook stocked with edible treats. (Full disclosure: After this writer’s visit, there was one fewer bags of peanut M & M’s.) 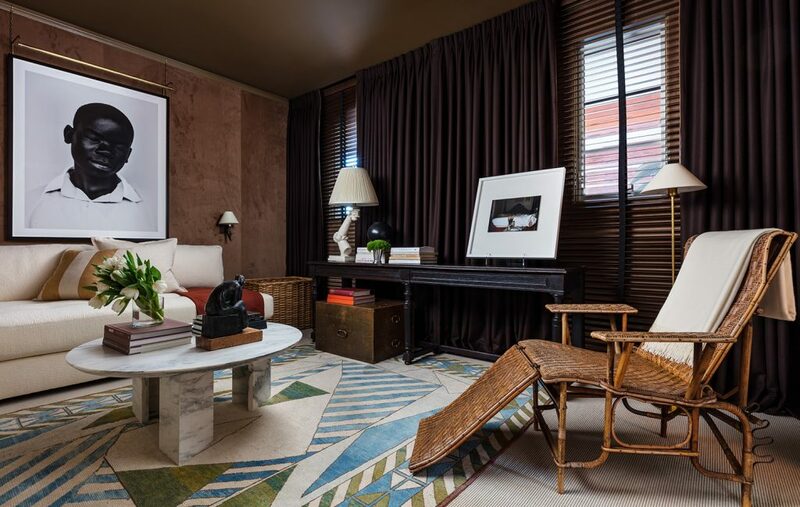 Luxurious Ultrasuede white fabric lines the walls of the mud hall, stair hall, and upper landing, where an intimate lounge area sits complete with a custom stripe carpet, tailored sofa, and étagère. 6. 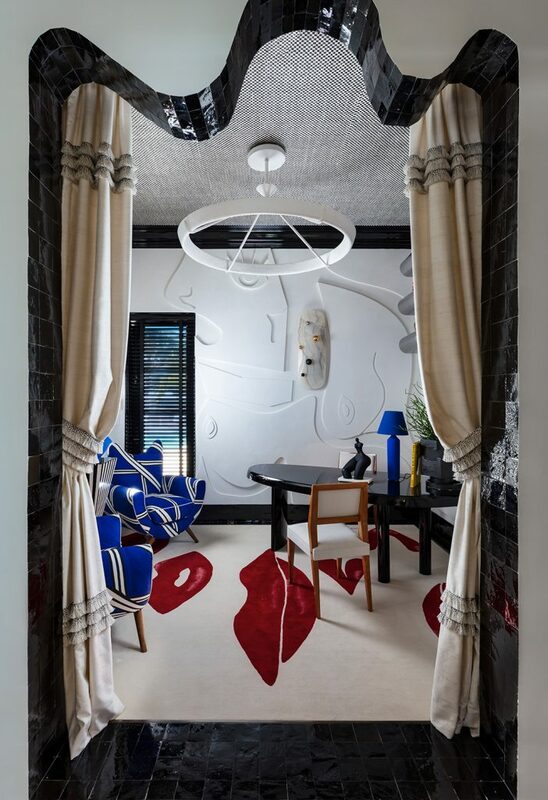 New York City–based Jessica Schuster transformed the breakfast room into an ornate, luxe space with a custom wool-and-silk carpet by Crosby Street Studios featuring a custom design of lips and hearts, while the ceiling features a checkerboard pattern with a mother-of-pearl inlay. A mix of modern and vintage light fixtures and large-scale modern art brings a touch of sensuality. 7. Connecticut’s Cindy Rinfret created intimate sitting areas within a sprawling living room. 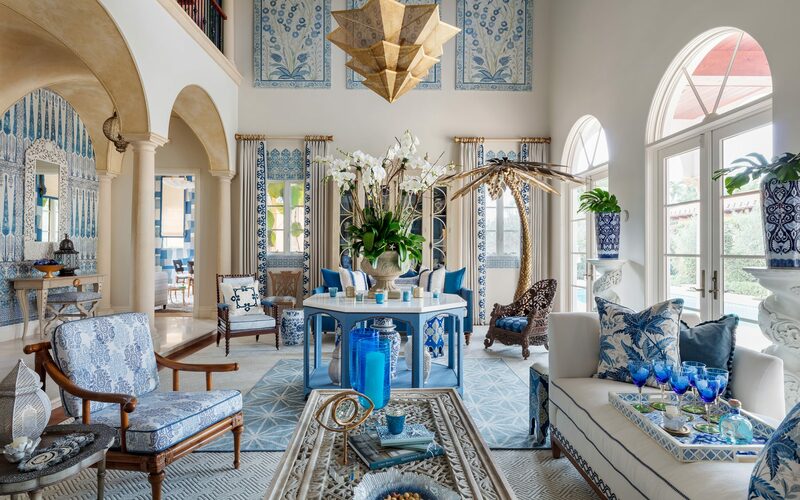 Patterned wall coverings, a painted ceiling, and decoupage trim appear in various blues reflective of the dazzling Florida coastline. 8. Lee Ann Thornton, who is based in Connecticut, offered her take on the Little Club, a bar in the storied Lyford Cay Club in the Bahamas. Optimum seating in a dramatic and intimate setting makes for a perfect drinks party. Tropical touches include pops of turquoise and raspberry, wicker lighting, a Waterfall woven wood shade by The Shade Store, and a natural seagrass rug. 9. Nashville designer Jason Arnold created this moody upstairs lounge, an ideal retreat from a day spent in the Palm Beach sun. A white sectional sofa pops against a chocolate wall covering by Phillip Jeffries. An antique mirror, rug, and armchair upholstered in black leather juxtapose a strong, high-contrast print by lauded contemporary photographer Bastiaan Woudt. 10. 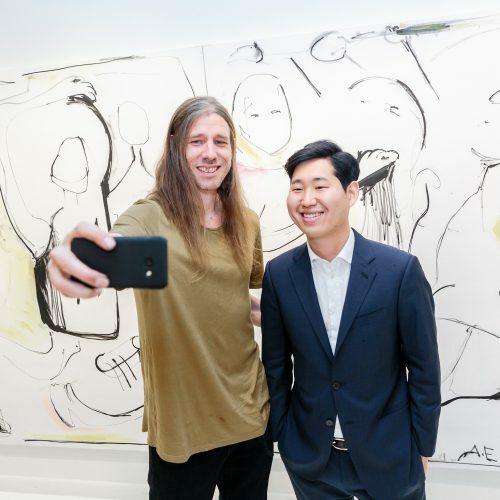 Kentucky-based Lee W. Robinson and Palm Beach–based Kyle Johnson drew inspiration from the whimsical European interpretation of East Asian art to transform the grand staircase into a Chinoiserie garden pavilion. 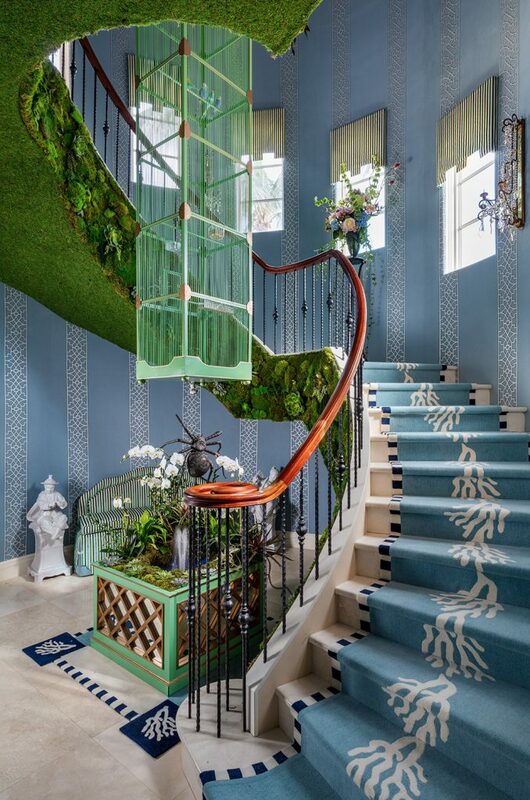 A living moss wall climbs up a winding staircase, which is hung with a showstopping grand pagoda birdcage suspended from a tented ceiling. 11. What tropical house would be complete without a loggia? 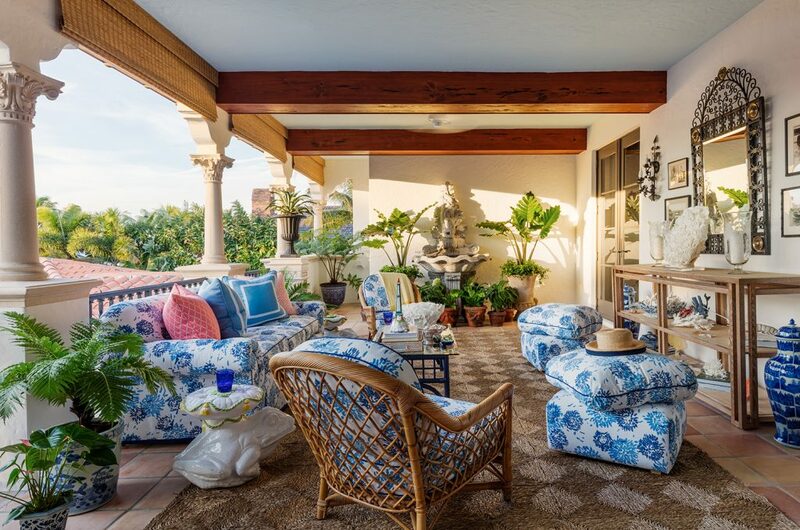 Louise Cronan created a relaxed and livable space that nods to the firm’s Florida roots with seagrass matting, bamboo, and wicker furniture, and blue-and-white-upholstered cushions in a signature chrysanthemum pattern by Leslie and D.D. Tillet. 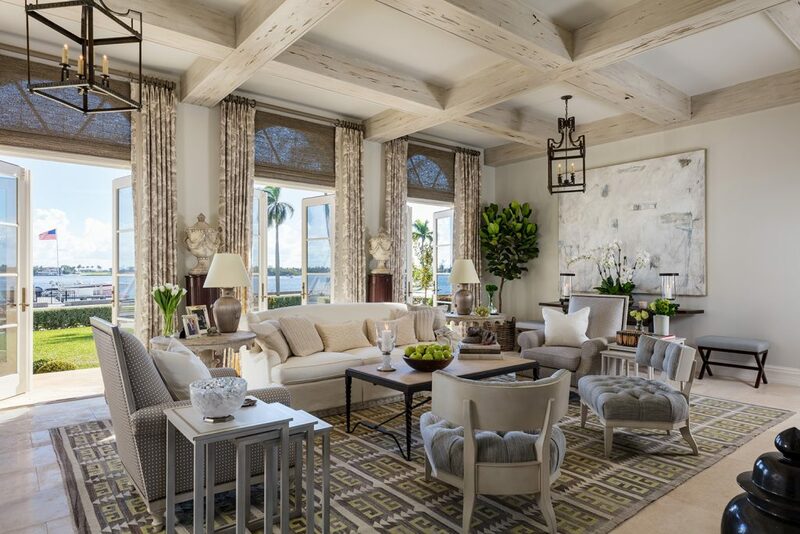 The Kips Bay Decorators Show House Palm Beach is open to the public through February 20 and is located at 6215 South Flagler Drive in West Palm Beach.